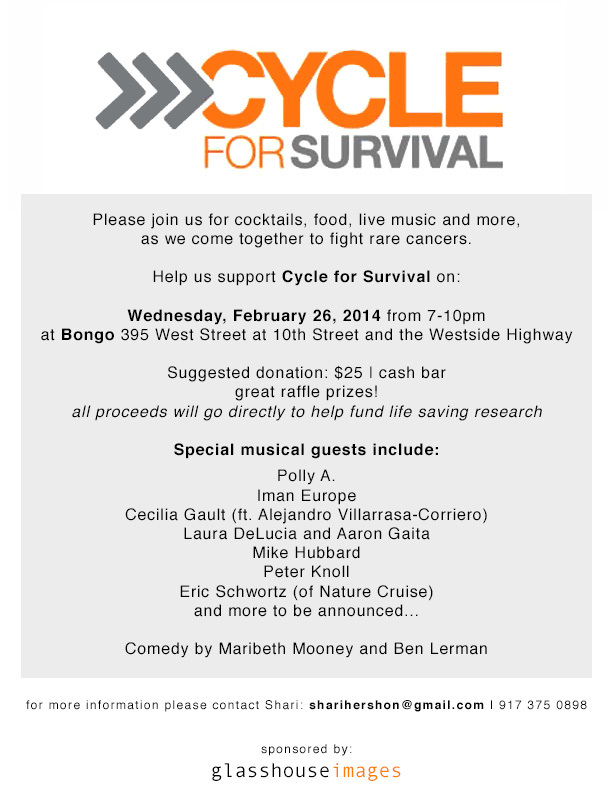 I am hosting a fundraiser for Cycle for Survival this Wednesday night and you are all invited! We have an amazing line up of musicians, comediennes, complimentary snacks, cocktails and a few special raffle prizes! (perhaps a designer handbag or two?) It’s at Bongo, a great mid-century modern lounge in the West Village that you all should know about. They have an amazing view of the Hudson River, and the best lobster rolls in town! We have added more artists since the invite was created, so look out for Polly A., (formerly performing as Meleni Smith), and the musical comedienne, Ben Lerman. You can check them both out on Spotify. They will be joined by the incredible Iman Europe and her beautiful, soulful vocals, and Cecilia Gault, whose talent far exceeds her years. We are thrilled to have Eric Schwortz of Nature Cruise doing a solo set, as well as local faves Laura DeLucia and Aaron Giata, guitarist Peter Knoll, and Mike Hubbard. And if your stomach hurts from laughing at Maribeth Mooney, don’t say you weren’t warned. Stay tuned, because you never know what else is up our sleeves! We are also grateful to Glasshouse Images for their support of this special event. If you are in New York, please come by and enjoy the festivities, while contributing to a very worthy cause. If you can’t join us, but would like to donate to Cycle for Survival, to help the amazing folks at Memorial Sloane Kettering Hospital fight rare cancers, please click here. All proceeds from the event will go directly into research, and no gift is too big or too small. I hope to see you on Wednesday night. Be sure to come by and introduce yourself, AND SPREAD THE WORD!! You can have a great time, while fighting cancer…sounds like a win/ win situation to me! Tags: Aaron Gaita, Bongo, Cecelia Gault, cycle for survival, Eric Schw, fundraiser, Iman Europe, Laura DeLucia, Maribeth Mooney., Meleni Smith, Memorial Sloane Kettering Hospital, Mike Hubbard, Nature Cruise, Peter Knoll, Polly A. This entry was posted on February 23, 2014 at 5:19 pm and is filed under Uncategorized. You can follow any responses to this entry through the RSS 2.0 feed. You can leave a response, or trackback from your own site.